To see a ward where patients stay overnight, choose "Penguin Ward" from the playlist. Choose from the playlist to find out more about people who work in a hospital. Click on the playlist to meet physiotherapists, pharmacists and more people who work in hospitals. To find out about MRI scans, blood tests and more, click on the playlist. Lift the flaps to find out what happens inside a hospital – and meet some of the amazing people who work there. Young children can explore the emergency and maternity units, learn how x-rays and scans work and see inside an operating theatre. With over 50 flaps to lift and links to websites where you can take hospital tours and meet patients. It's beautifully engaging with so much to see on every spread and with lots of flaps to open on every page. We love it. a fascinating insight into what really goes on in a hospital [...] a hugely important book for any child who might be visiting ill relatives or need to go into hospital themselves. The book sensitively and engagingly explains how hospitals are places where ill or injured people go to get better. [...] this is a reassuring and helpful guide for both children and parents. The lively and colourful illustrations are packed with detail to absorb and discuss, and they are well captioned. [...] It's a well presented and reassuring book, which gives just enough information to put young children's minds at rest. The best part of this book is its ability to make the intimidating and frightening thought of going to hospital seem less threatening to children. We are very impressed with this book. My son has really enjoyed exploring it. We have had a few visits to the hospital recently and my son is fascinated with how it shows what he saw there. The lift the flaps have definitely made it very interesting and engaging for my son. My daughter wants to be a midwife when she grows up so she was totally delighted with this book. It's a good size, not too large, but still crammed full of lots of fantastic information about hospitals. Divided into seven sections: arriving, outpatients, emergency, staying overnight, scans and tests, operations and mothers and babies, there are lots of flaps to interact with. Lots of great questions were asked. A really good factual book that makes good use of space and uses all the right terminology. Excellent in fact! This book shows what life is like in a hospital. It’s very educational because it gives lots of information about the body, for example it has a diagram of the tonsils and explains what they do. It’s presented very nicely and has lots of lift the flaps in it. A fact in here I didn’t know before is that young patients can do school work in a school room when they are at hospital. The book is straightforward to read and is very interesting. 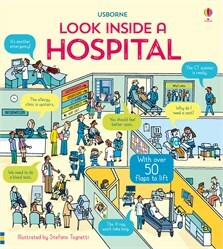 Another great and informative book from Usborne, this time about hospitals. My 6 year old has been interested in hospitals since his dad had an accident recently and had to stay overnight, he has also got into watching Operation Ouch. This book explains lots about hospitals and what happens in them without being too overwhelming with information. We love the lift the flap format as my son still loves flap books so finding an age appropriate one (especially about something he is interested in) is brilliant. The book takes you through different aspects of being in a hospital, different wards and why you might be on them, with lots of little extra bits of information under the flaps. A really good book for 5-8 year olds, I really must look at more of this series! The illustrations are very appealing without being really gory or graphic. Excellent informative book about Hospitals. This book made learning about hospitals really fun for Ivy. She loved opening the flaps and asked lots of questions about the health topics inside of the book. The facts are simple yet detailed enough for children to understand the goings on and terms used in a hospital environment. This will be a really handy book for us as Ivy attends hospital appointments regularly. Excellent book full of useful information! Both my girls loved lifting the flaps and asked lots of questions! Love, love, love this book! We are big fans of Usborne already- but this is by far the best. I cannot believe the amount of information that is in it, and the way it has all been displayed. This is an amazing book for kids like mine who love Operation Ouch, but also great to share with children who are going to hospital. We love Usborne books. It's a nice large board book with sturdy flaps. Very informative for children learning about hospitals. Sophie loved looking at the playrooms and the children's ward, showing the fun elements to hospitals. She liked pointing everything out and asked lots of questions. My five year old just adores this book. Lately she has become interested in anything medical and learning all the facts about the hospital has been very intriguing to her. She can spend a very long time opening up all the flaps and reading them to herself. We would highly recommend this book to others. Isabella sat and read this cover to cover and really enjoyed it, she loved lifting the flaps and found it very interesting. Full of great facts and fab pictures, she has now passed it onto a friend to enjoy as well.